So, it is now Goodwood plus one (one day after the Goodwood Revival – it’s all over, waah!!) and #todayimwearing non-vintage. Sob. The weekend flew past in a spectacle of seriously old cars (and valuable – some of the Ferraris were worth $30,000,000. And I touched one. Actually touched it! Does that make me richer? No?? Ok..), crimson lips and…. camels. No really. 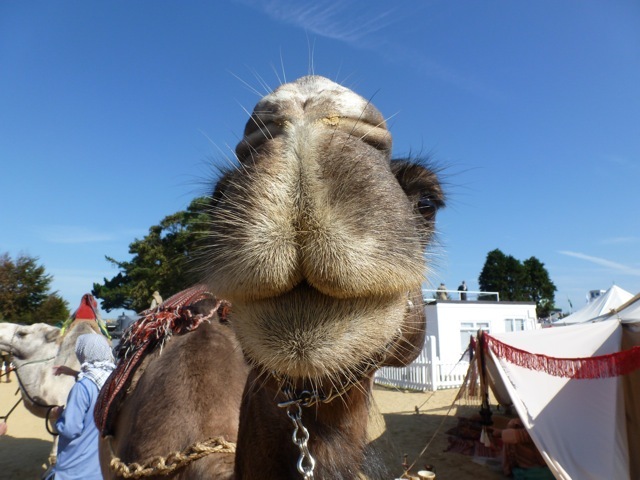 Entrance to the Rolex Drivers’ Club this year was lined by Abdul and Salman, the friendly camels.. And no, they didn’t spit. Although they did wee an inappropriate amount for the amount of vintage fabrics tottering around. Racer Boy did pretty well (lucky 13th in his race and second 2nd in class), and the ball was fabulous – Russian themed. Don’t ask me why.. We ate chicken kiev and drank Moscow Mules. Oh, and just a little bit of Veuve, too..